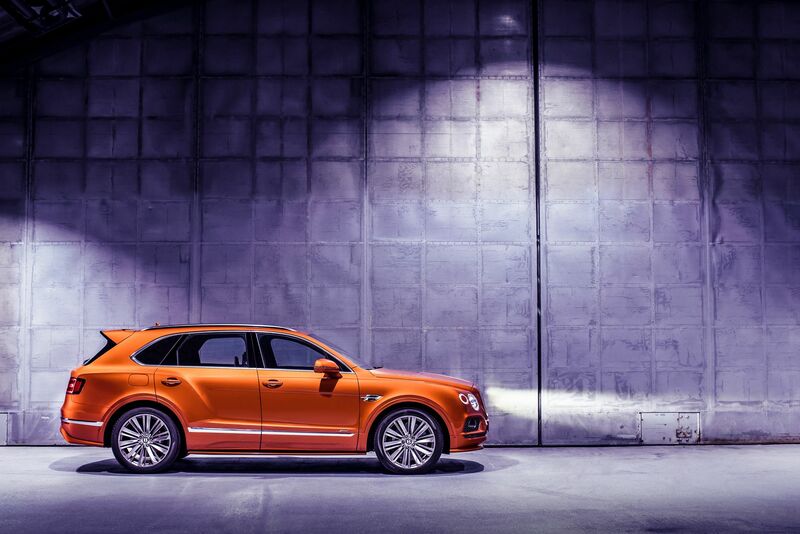 Toys Bentley's Bentayga Speed Is "World's Fastest SUV"
Bentley's Bentayga Speed Is "World's Fastest SUV"
Bentley has announced what it calls the "world's fastest, most luxurious SUV:" the Bentayga Speed. Naturally, the 6.0 litre twin-turbo W12 engine is the star of this Speed-styled Bentayga; this model brings the top speed up to 190mph from the standard Bentayga's 187mph—now just barely faster than the Lamborghini Urus by 0.5mph—while producing 626hp and 662lb.-ft of torque to all four wheels. It can sprint from 0mph to 62mph in 3.9 seconds while the Continental GT coupé makes the same run in 3.7 seconds. Naturally with that speed and power came a new set of lightweight but heavy-duty carbon ceramic brakes which are "the largest and most powerful ever fitted to a Bentley." It's controlled by an eight-speed transmission and four driving modes including a Sport mode to enhance engine, transmission, and suspension response for a "more dynamic and engaging drive." A 48V electric roll control system counteracts lateral rolling forces to ensure that the tires stay on the ground, and handling is top-notch. The model, which already had a sporty aesthetic thanks to the Bentayga designation, received a handful of Speed-specific cosmetic upgrades that make its stance appear even more athletic. In addition to the body-colored lower bodywork and tailgate spoiler to streamline the model, the radiator and bumper grilles have been darkened and owners can choose to select one of three finishes for the 22-inch wheels. The Bentayga Speed will debut at the Geneva Motor Show next month and go on sale later this year. While pricing hasn't been announced yet, the standard Bentayga starts around US$200,000, so the Speed version can only go up from there. Toys Could This Be BMW's 8 Series Gran Coupe?